Starr's new financial novel "Dough Rising" is now available !!! You are here: Home / Investing In Securities / What about Those Bonds? One way corporations and various governmental agencies raise capital for projects and activities is through bonds, a debt investment issued for a specific period of time and at a fixed interest rate. Interest is generally paid every six months. On the maturity date the face value is paid to the investor. Bonds are usually issued in $1000 denominations and rated by bond rating agencies, such as Moody’s, Standard & Poors, and Fitch. The rating helps you to determine how risky the investment is. Ratings range from AAA for the highest quality to CCC or Caa, and are determined by the entity’s ability to repay the bond. Bonds issued by federal, state and local governments carry a high rating and sometimes offer tax benefits. Interest earned on Federal obligations is not taxable for state income tax purposes; municipal bond interest earned on state and local bonds is not taxable for federal purposes but may be taxable at the state level. Bonds issued by newly-formed corporations or companies in financial difficulty have a lower rating, but offer a higher interest rate to attract investors. 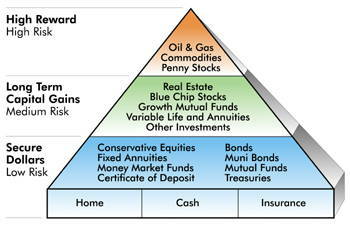 As with any investment there are advantages and disadvantages to investing in bonds. The interest rate is generally higher than rates for savings and money market accounts and Certificates of Deposit. Bonds are predictable. You know exactly how much you will receive and how often and when your principal will be repaid. Bonds are typically more stable than stocks. If the company or municipality goes bankrupt, the value of the bond will drop or possibly become worthless. If you sell your bond before the maturity date and current interest rates go up, the value could go down. When new bonds are issued the stated interest rate is at or close to prevailing interest rates. As market interest rates change, a bond’s coupon rate which is fixed becomes more or less attractive to investors. There is said to be an “inverse relationship” between interest rates and bond prices – when one goes up, the other goes down. Unlike stocks, there is no growth potential to bonds. Depending on the bond’s interest rate, there is the possibility the income will not keep up with inflation. Bonds are considered a viable investment for those needing steady, relatively reliable income such as the elderly or disabled or individuals with a low risk tolerance.